The 1887 N28 Allen & Ginter World Champion's Set contains 50 cards, featuring the popular athletes from the late 19th century. 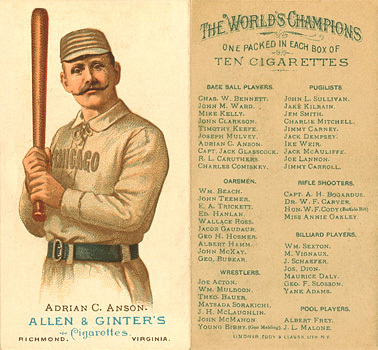 The 1887 Allen & Ginter cards are some of the most attractive N cards ever produced and can be easily identified by the the words "Allen & Ginter's Cigarettes" and "Richmond, Virginia" on the card fronts and "World's Champions" on the backs. The N28 cards are unnumbered and measure approximately 1 3/4" x 2 3/4". The 1887 N28 Allen & Ginter World Champion's Set set is comprised of 10 baseball players and 40 other athletes from Boxing, Rowing, Shooting, Billards & Wrestling. Some of notable athletes from this issue are: Cap Anson, King Kelly, Charles Comiskey, Jack Sullivan, Annie Oakley and Buffalo Bill. CLICK HERE if you want to sell your 1887 N28 Allen & Ginter World's Champions Cards.